The Harlequin Appaloosa coloring has been present in North America for years, but has only recently begun to achieve popularity and recognition among alpaca breeders. More common in Suris than Huacayas, the Harlequin gene represents a powerful genetic key: it can produce any variety of unique and gorgeous colors and patterns, ranging from light beige and fawn appaloosas -- with fiber a handspinner's delight -- to solid silver and rose greys with astonishingly spotless blankets. 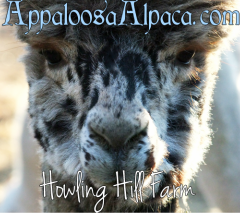 Howling Hill Farm was founded in 2013 with the goal of focusing on Huacaya alpacas with the Harlequin Appaloosa coloring (as well as classic tuxedo and modern greys). At the time, the rarity and value of these gorgeous animals made this seem like a distant goal. We are now much closer than we believed possible at that time, with more than a dozen foundation females and half a dozen herdsires that express the harlequin gene. Our goal is to produce elite quality harlequin appaloosa alpacas, and we are ever learning about the coloration and its inheritance in an effort to unlock the key to consistently producing outstanding harlequins. Whether you are new to the Harlequin Appaloosa alpacas or a seasoned breeder, we invite you to explore our site to learn about the Harlequin Appaloosa gene in alpacas, and to see what our Harlequin breeding program is all about.